The Red Rhododendron, Hellikki, is an exceptional rhododendron developed in Finland for hardiness in much colder regions than classic rhododendrons will tolerate. Not only that, this is the rhododendron you want for those full-shaded areas where other rhododendrons will fail. 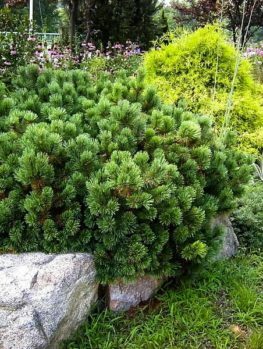 Unhappy in sun, this gorgeous and dramatic plant is the perfect choice for shady spots, where it will bring brilliant color and beautiful evergreen foliage to create a dramatic presence in your garden. It produces dark violet-red flowers set against lush glossy green foliage. The open, cupped flowers come into full bloom by mid-June, creating a burst of color just as your earlier rhododendrons are beginning to fade. The leaves have a soft, brown, felt-like texture under the leaves, associated with all the best varieties and adding interest to your plant. Designing a garden can be a fun and exciting process that lets your imagination run wild. While choosing all of the various elements you would like to have in your garden, you’ll want to plan for those empty open spaces or long shapeless boundaries. The perfect solution to break up these kinds of spaces is by using rhododendrons; a slow growing, dark-foliaged shrub that sports clusters of brightly colored flowers throughout the summer months. 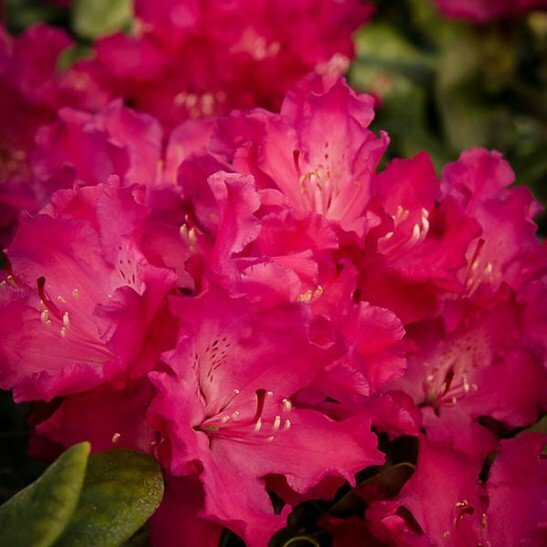 With over 1,000 varieties of rhododendron to choose from, and more being created through cross breeding programs like the one at Finland’s Helsinki University, you will never run out of choices. Hellikki is a relatively new variant of the rhododendron but that doesn’t mean it lacks any of the versatility of its predecessors. The rhododendron species is exceptionally hardy in both cold and warm climates; it produces beautiful flowers, and is very low maintenance. 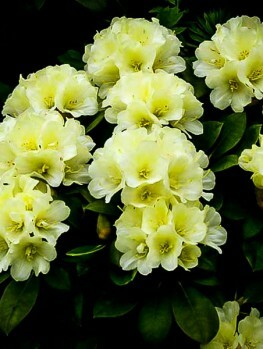 Dr. Jarjatta Uosukainen of the University of Helsinki in Finland is responsible for the Hellikki rhododendron; it was first created in 1974 by cross pollination between the smirnowii Seidel hybrid and another cross created from catawbiense hybrid “Atsosanguineum” and arboretum hybrid “Doncaster”. 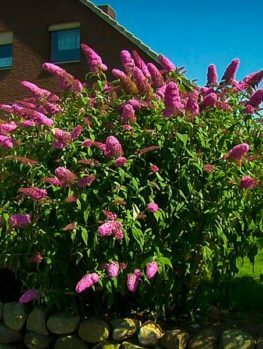 These cross pollinations resulted in the Hellikki producing its deep violet red flowers throughout the summer months, while the dark green leaves are maintained throughout the year and maintain the shrub’s visual interest after the flowers have died off. This variant can reach a mature height up to six feet, with a modest five foot width. 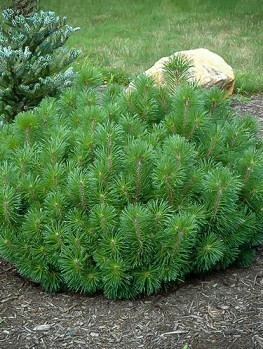 It typically grows into a mounded shape resembling a ball. 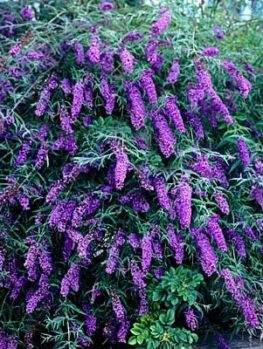 A tolerance for USDA plant hardiness zones 4-8 allows this particular shrub to be enjoyed in many locations throughout the United States. Tolerant of cold temperatures down to -30° F, it can also do well in the heat and humidity of more southern locations like Texas and Florida. 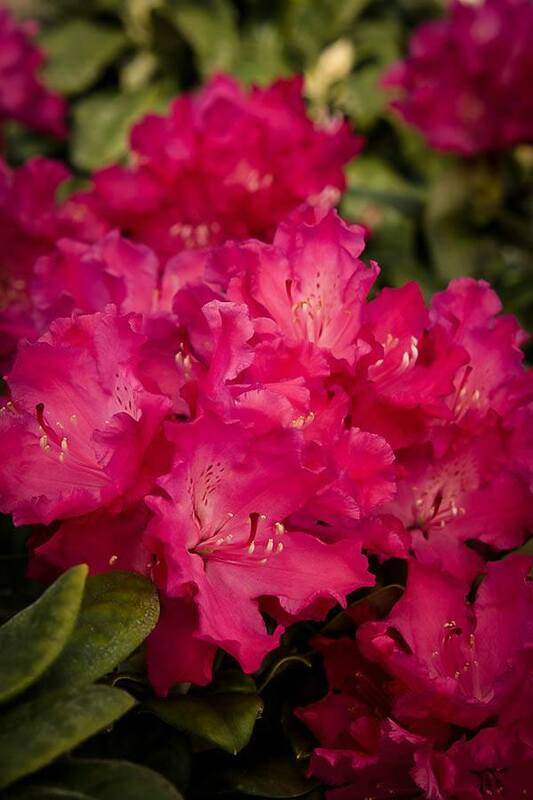 Rhododendrons like light, well-drained soils that are quite moist. 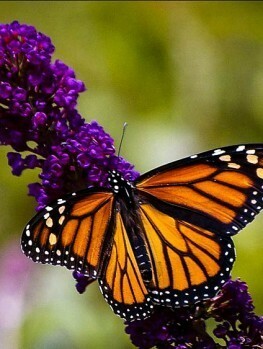 They thrive in soil that has a pH level close to 5.5 and that which is high in organic matter. The Hellikki likes full shade but can also fare well in partial shade environments, as long as it is not exposed for long periods of time during the hottest hours. 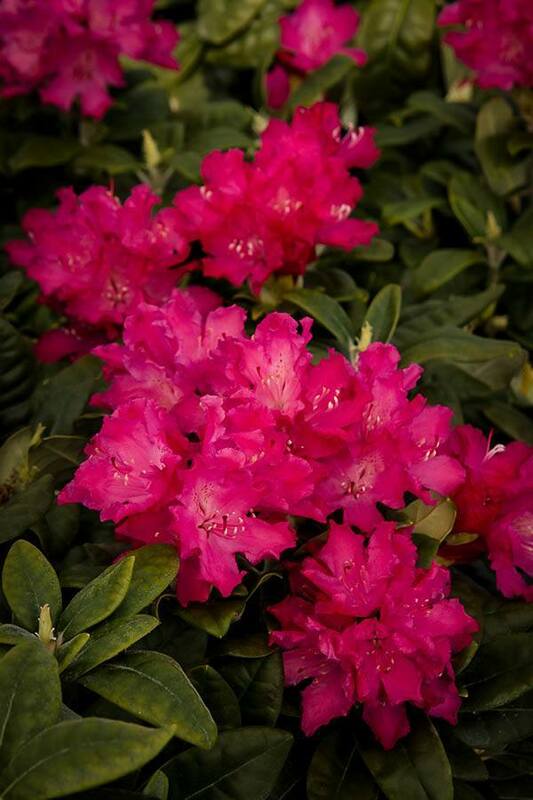 The red rhododendron requires very little maintenance or upkeep, but you will want to ensure that the shrub is receiving adequate water during the first growing season so that it can develop a deep and extensive root system. Ensure that the location is well-drained to avoid root rot, and only feed with an acidic fertilizer after the flowers have bloomed. You can also use decorative mulch at the base of the Hellikki to keep the roots cool in the summer months and maintain soil moisture. During the summer you will also want to make sure that the rhododendron does not go for too long without water. If you are experiencing a dry hot summer, keeping the plant well watered will ensure that it survives longer periods of drought. Even though the rhododendron can handle cold winter months exceptionally well, if you are experiencing a sudden cold snap or unusually high snow fall, you can take steps to protect it by covering it in burlap. Rhododendrons do not like to be out in the open in high wind areas. Make sure to choose a location that can offer some protection against high winds if you live in an area that is prone to very blowy conditions. Pruning the rhododendron is very much down to personal preference. Most shrubs of this nature do not require regular pruning and are able to grow naturally with very little interference. However, removing dead or dying branches can help encourage new growth and encourage the appearance of more flowering branches. There are several pest insects and diseases you will want to keep an eye out for; early detection of any changes in the leaves, branches or flowers or increased insect behavior can usually prevent any lasting damage. The red Hellikki rhododendron is an obvious choice for practically any location that requires a medium sized plant. 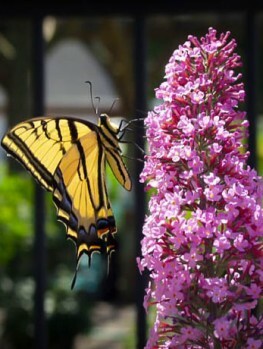 Taking into consideration the abundance of benefits the Hellikki can bring to your landscape will help seal the deal. Their easy maintenance and robust nature will bring many years of enjoyment and beauty to your outdoor living space, not only for your generation but for those to come. Here at The Tree Center, we offer many varieties of rhododendrons that work well together. 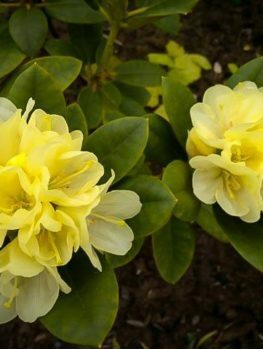 If you don’t want to stick to just one species or one color you can mix and match to create a colorful and interesting landscape by adding other varieties, such as the Lemon Ice Rhododendron and the Nova Zembla Rhododendron. If you have any questions about your chosen plant, please feel free to get in touch with us at 1-888-329-0140. Our experienced staff is at the ready to answer your questions about your chosen plant, discuss payment and shipping options with you, or simply guide you to the perfect plant to fit your needs and space.